As a working adult who spends most of the day in front of a computer, physical activity has become an important part of my life. I need that “me” time for both my physical and mental health. After years of going to the gym for classes and cardio, I decided it was time to mix things up. My husband has encouraged me to run distance for some time. At Christmas, when I was undecided on what to give him, I accepted his challenge and signed up both of us for the Eugene half marathon — a 13.1-mile gift from me to him. I began my training by researching and developing a calendar. 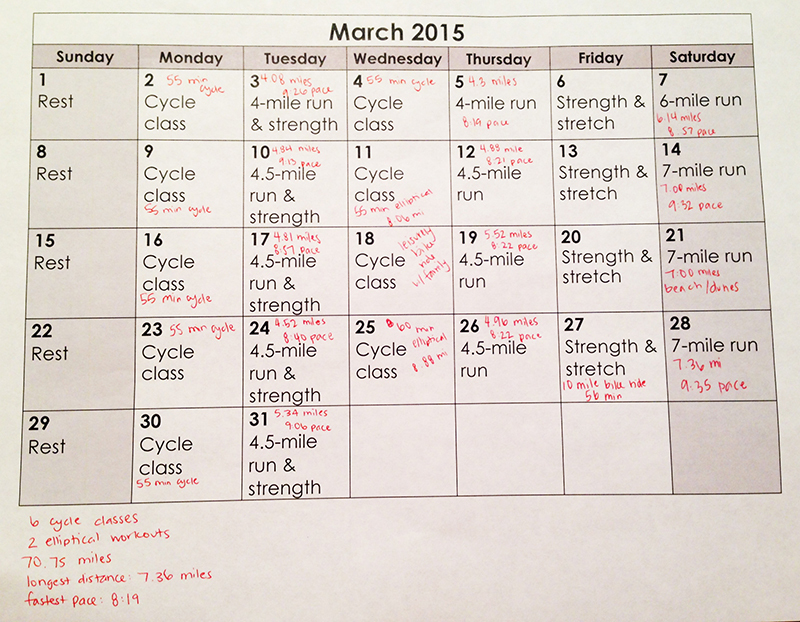 My 18-week plan includes a mix of cardio (spin classes and running) and stretch. I printed a copy and posted it to the kitchen wall for daily goal setting and accountability. It’s right there when I wake up in the morning, reminding me of what I need to accomplish that day. Tip No. 1: Accountability and consistency can help you stay successful. I would highly recommend setting a schedule, making time for exercise and then keeping track of it. There are, of course, apps for this, but I find that there’s something satisfying about using a pen and paper to track my progress. I’ve also found it very helpful to have a training partner. 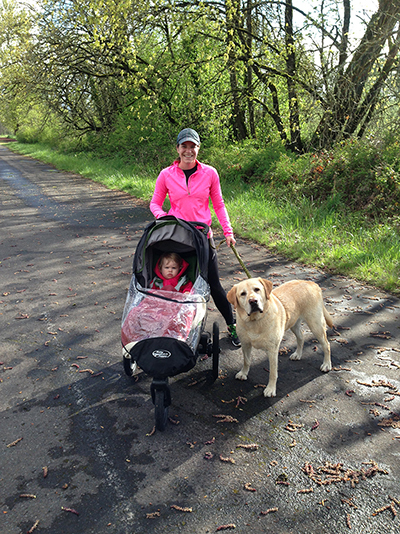 I run by myself one day a week and my husband, daughter and I run together two days. (Technically, she rides in the jogger.) It’s a nice family activity that gets us outside, in the fresh air. We’re blessed to have a great network of paved trails in Eugene/Springfield that allow us to run without cars or interruption. Tip No. 2: Find a family member or friend willing to share the journey. I think it’s important to have someone who can support you and understand first-hand the challenges you’re facing. That person doesn’t necessarily have to live nearby, since so much communication is digital these days, but it doesn’t hurt to have a running buddy. I think one of my biggest obstacles is believing I can do this, and that 13.1 miles isn’t unattainable. Yes, there are days that I’m tired or have sore muscles, but I just have to lace up my shoes and get going. I’m up to running 7 miles on Saturdays and last week I thought to myself “How am I going to do this? I’m only halfway there.” But it’s true that it gets easier the more time (and miles) you put into it. Tip No. 3: Once you commit, stick to it and then celebrate little victories along the way. I may only be halfway, but I’m still farther than where I started. You rock, Lindsey! Way to go!! You are doing great. You got this.